Well, June just kind of snuck by me and I didn't write a review. That's not to say that I haven't been reading - I just haven't been writing about reading. But I have a really good book for this month. It will rip your heart out, but it's good. 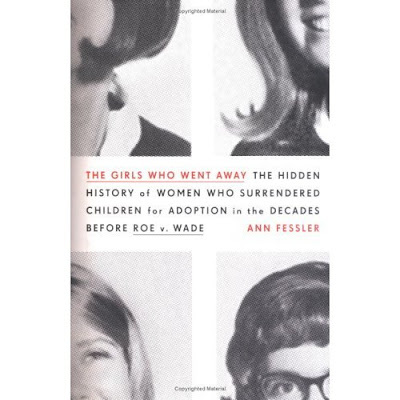 It's "The Girls Who Went Away" by Ann Fessler. This non-fiction book tells the stories of the unmarried girls and women who gave up their children for adoption in the period between the 1945's and 1973. You know - those girls who went to go visit their "out of town aunt" for a few months, and then mysteriously returned. These are the true stories about what really happened after they left town. Let me give you the set up for the book. Ann Fessler, the author and adoptee herself, interviewed more than 100 women who had given up their newborn babies during the above time period. The time period is important for several reasons. For one, it's post World War II. Unlike the previous Depression Era when people were just trying to get by financially, class and social standing became very important in the post WWII Era. People worked very hard to maintain appearances as being upright, moral Americans. Having a teenage daughter get pregnant just wouldn't do. So, they would ship their daughters off to a home for unwed mothers for a few months, lie to their neighbors about what was going on, and then act as if nothing happened after the girls returned. The end date, 1973, was the year that Roe v. Wade was decided and legalized abortion in the United States. There is no other way to describe this book other than heartbreaking. While the details of the women's story change, the basic facts remain the same: 1) girl gets pregnant, 2) parents ship her off to home for unwed mothers to avoid social scandal, 3) girl is treated horribly at "home" by social workers, employees or members of the church (including withheld medical attention during delivery), 4) girl has baby taken away even if the girl wants to keep the child, and 5) girl told to never speak of it again. The aftereffect of this trauma for these women was also consistent, even decades later. Though manifested in different ways, the baby they gave up (or were forced to give up) for adoption haunted them through the rest of their lives. Some could never get over the sense of betrayal from their parents, and would never trust anyone again. Others became overly-protective of their later children because they were always afraid someone would come take them away. But none of them ever forgot about their first child. The one who was taken away from them. It's just tragic. It's hard to recommend a book that is so emotionally difficult to read, especially when it's non-fiction, but I highly recommend "The Girls Who Went Away." Just have a box of tissue nearby when you do.